The UK's Best Christmas Markets...for Adults! 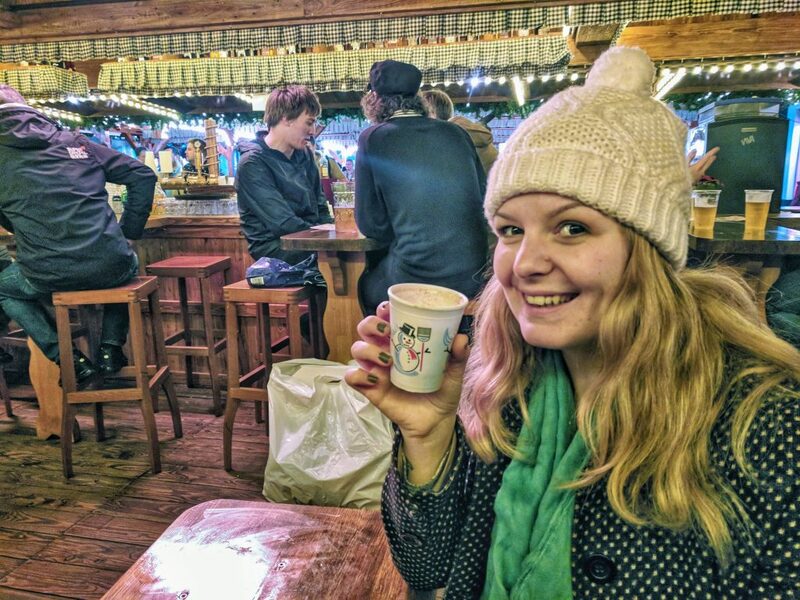 The UK’s Best Christmas Markets…for Adults! With carnival rides and sugary treats, Christmas markets are a great place to take kids during the holiday season. But who says adults can’t have just as much fun? More and more Christmas markets are becoming “adult-friendly”, offering an array of food and drink options, adult activities like movie screenings and comedy shows, and even the occasional German beer tent! 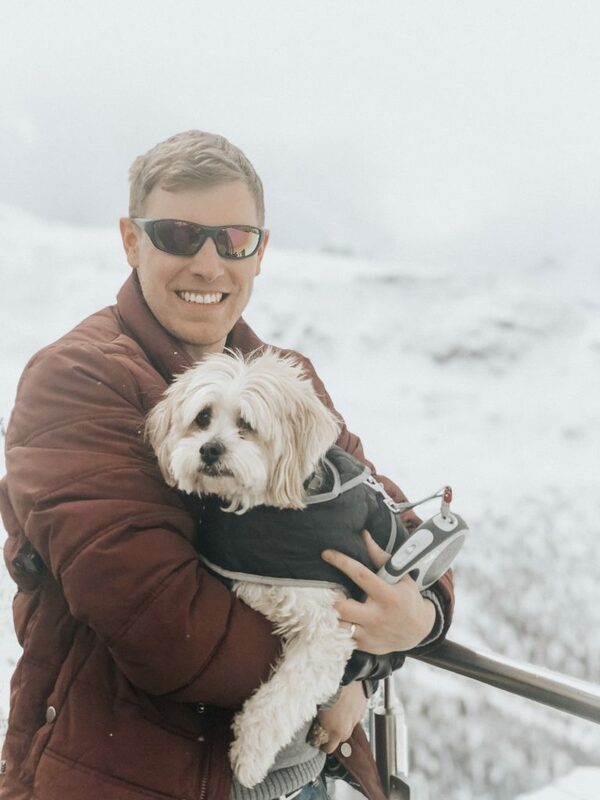 And with so many Christmas market options in the UK, we decided to dive deep and highlight the ones that are going above and beyond to make adults feel like kids again during the holiday season. Here’s our list of the UK’s best Christmas markets for adults. 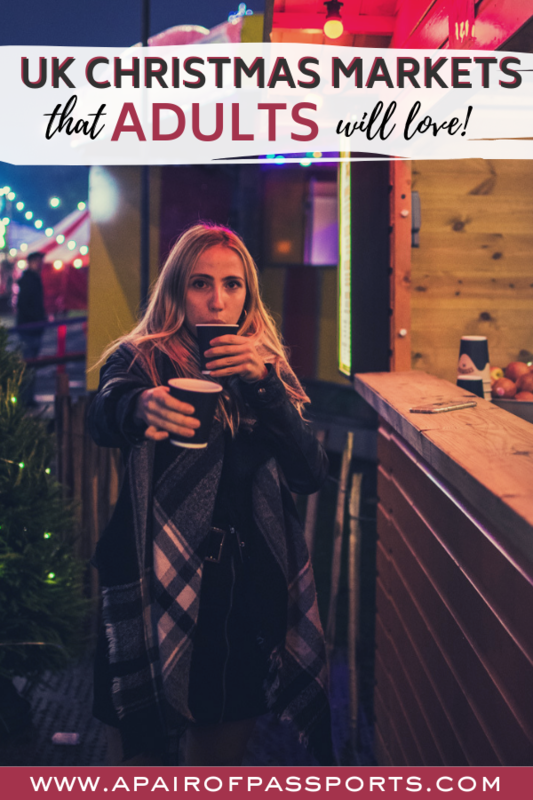 So what makes a Christmas market ‘adult-friendly’? These market go above and beyond kitschy decorations and a place to queue up and meet Santa. 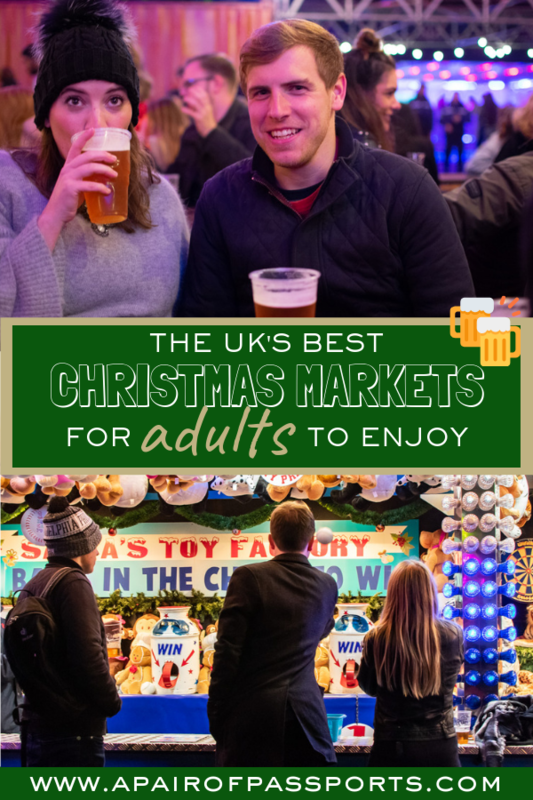 The UK’s best adult-friendly Christmas markets offer opportunities to purchase quality Christmas gifts, activities geared towards adults, or an incredible selection of food and drink. Some of the markets even offer all three! Read on to discover the best adult-friendly Christmas markets in the UK. Leeds Christkindelmarkt is one of the best Christmas markets for adults. 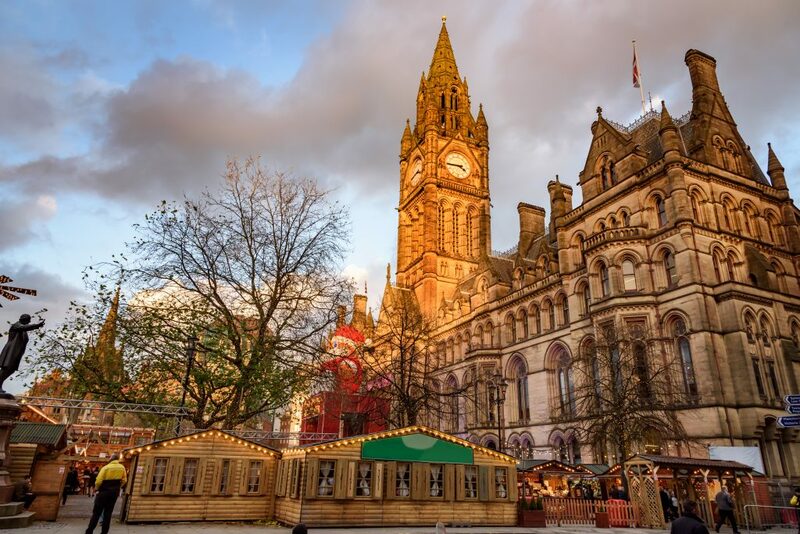 Situated in central Millennium square, its traditional wooden huts, fairy lights and indoor retreats capture the essence of what a Christmas market is about: hearty food, ample drink, mulled wine, quality stalls, and a relaxed festive atmosphere. The best part? Even if you attend on a busy weekend there are plenty of indoor retreats to escape to. My favourite is the staple Bavarian meeting hall; as cosy as it is fun. This never fails to drown out any crowds outside and slow you down, with drink, food and evening entertainment. 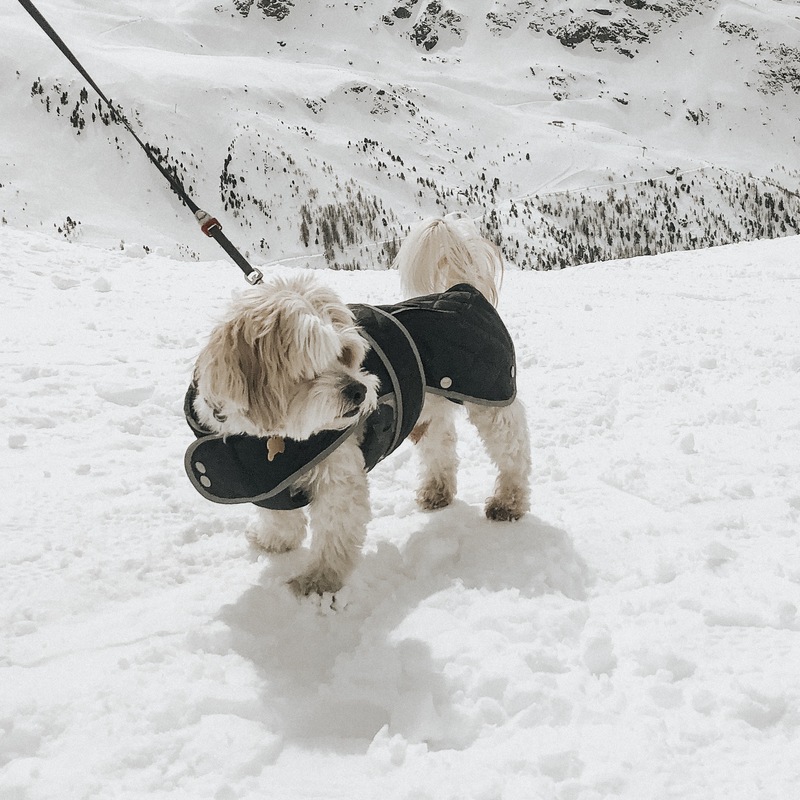 Other havens include the Ski Chalet and Kuh Stall, with grilled sausages, steaming hot chocolate, cackling fires, and of course, more beer. Along with eating and drinking your way around the market, there are a variety of quality stalls. So adults, if food and drink is not a good enough excuse, get some ideas for Christmas presents. Stalls often include crafts, jewellery and other unique gifts. Whilst there are some rides, it is contained and organised, with the main focus on the traditional Christmas market. And let’s face it, who can resist a traditional carousel ride. Manchester has a brilliant Christmas market that is nicely spread across the city and is bigger and better than ever. I love the fact that the festivities are spread across the city as it means it doesn’t feel as crowded as other markets. For me, the stars of the show at Manchester Christmas market are all the food vendors. I know we all associate the traditional Christmas Market with Gluhwein and Bratwurst but if you are looking for something different there is plenty on offer at Manchester. The market has a far more European than simply German feel with traders from Italy, Netherlands and further afield. I also love that there are some local traders selling Manchester and regional produce – my favourite being the cheese stalls! Manchester really has something for everyone! The Georgian city of Bath is such a romantic city to visit, and its Christmas Market is the ideal excuse to spend a luxury weekend away there. 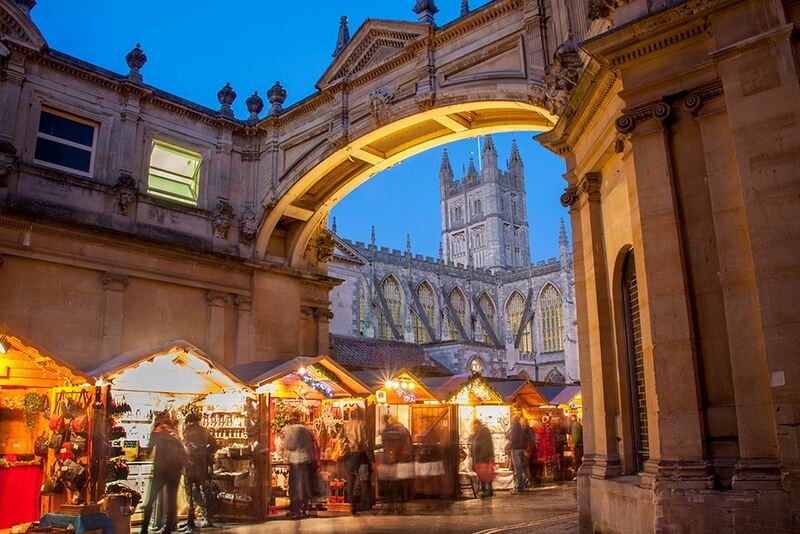 The first reason to visit the Bath Christmas Market is its extraordinary setting. Many of the stalls are clustered together in Abbey Churchyard, below the vast Gothic windows of Bath Abbey. They’re also around the corner on York Street, with additional markets along nearby Bath Street and Abbeygate Street. 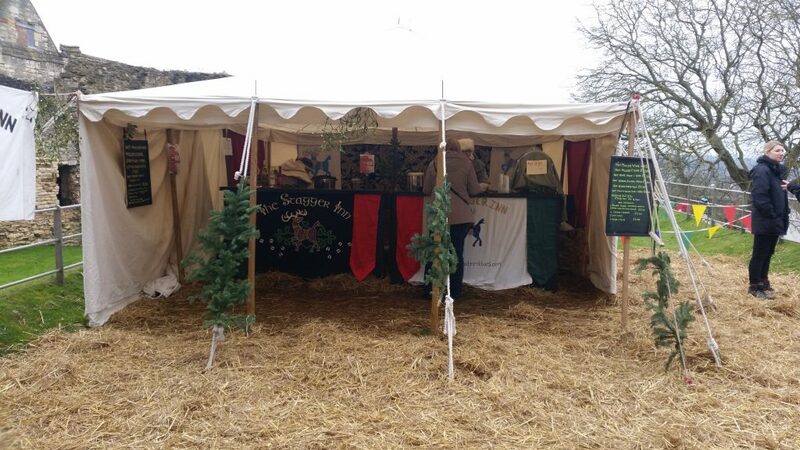 You’ll find all the traditional Christmas market treats, including spicy mulled wine to ward off the cold. There are over 180 stalls in all, so if you’re struggling for ideas for Christmas gifts, you shouldn’t be for long. One of the great things about Bath is that most of the main sights are very close together. The Pump Room was the place to be seen in 18th century Bath, and they do a wonderful afternoon tea. Downstairs from there is the Roman Bath, and in winter you can see the open air Great Bath by torchlight, an amazing experience. Several hotels in Bath offer luxury spa breaks, and you can relax in the heated rooftop pool of Thermae Bath Spa, with stunning views of the Abbey and city skyline. 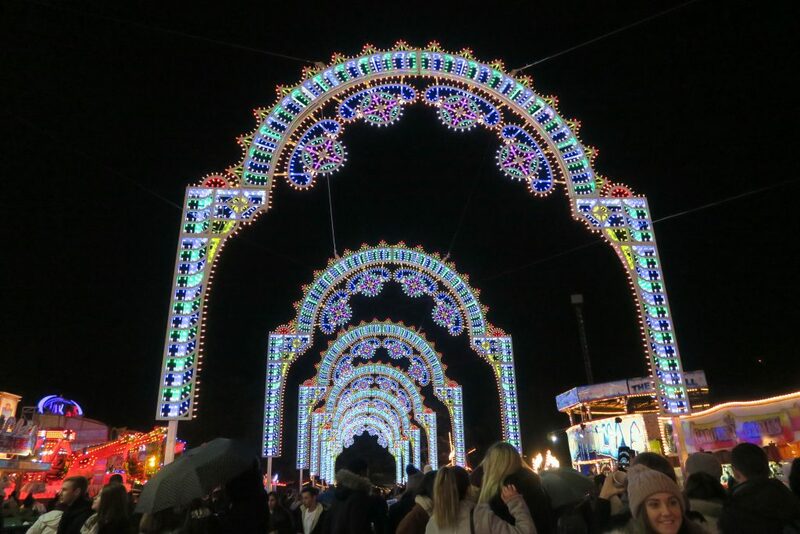 Southampton city, one of the largest cities on the south coast yet, their Christmas Festival which runs from Friday 16 November – Sunday 23 December 2018 is relatively unknown. Overshadowed by the more popular markets like Bath and London, Southampton Christmas market is run by WELA Märkte GmbH, a German company who have been running Christmas markets for three generations. Obviously, they know a thing or two about what makes a great German Market! Unlike many Christmas Markets, Southampton Christmas Market isn’t all about the kids. In fact, it’s more adult focused and features not just 1, but 2 “beer gardens”. These little huts are warm, inviting, and you can grab yourself a stein of beer, some mulled wine, or even alcohol filled hot chocolates. Not only that, but there’s live music performed daily by real Bavarian musicians. Just as important as the drinks is the food. There’s such a wide range of choices and many of the stalls are completely food related. Bratwursts, crepes, pulled pork sandwiches – whatever you fancy, it’s there. What more could you want from a Christmas market? Southampton’s got, drinks, great food, live music and everything you need to get in the Christmas spirit. Lincoln is a city in Lincolnshire that is steeped in history, historic buildings and yearly events. Their biggest event, held every year, is the Lincoln Christmas Market. Lincoln is the perfect backdrop for the market. It is a great place to shop for unique and unusual Christmas gifts for friends and family with over 280 stalls. The market provides you with many opportunities to try different foods from around the world. 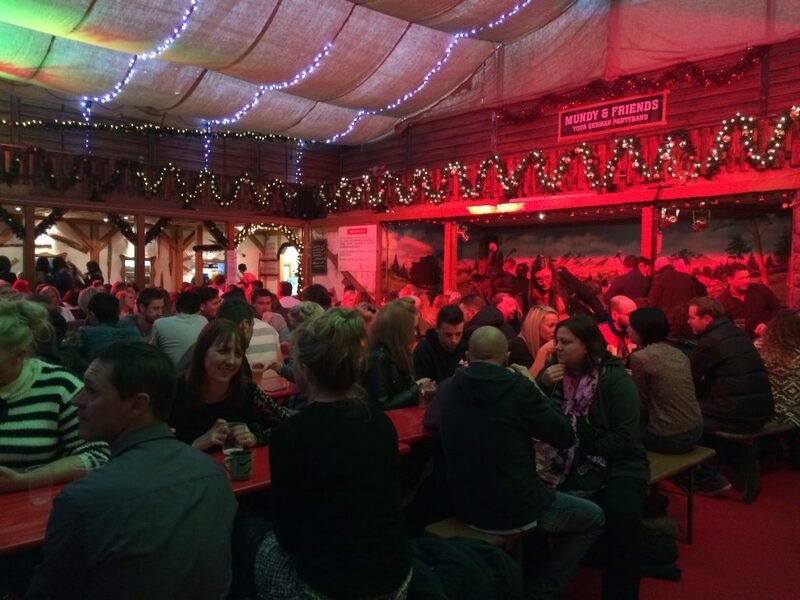 There are many bars dotted all around the market selling hot mulled wines, beers, wines and more. Another great thing about the Lincoln Christmas market is the late night opening so you don’t have to worry about missing out if you can’t get away from work. The market really comes alive at night and if you’re feeling brave, why not ride on their large wheel that arrives every year? I promise you won’t be disappointed with the view. 2018 Dates: Thursday 6 December 2018 – Sunday 9 December 2018. Hours vary. Click here for more information. One of my favourite Christmas Markets in the UK is the Christmas Market in Glasgow, Scotland. Glasgow becomes really charming when it gets decorated for Christmas and, with the market, it gets even better. The market in Glasgow is quite compact – it has to fit within the George Square – but it has a couple of attractions (for children), plenty of souvenir stalls and a lot of food stalls with benches for sitting down. 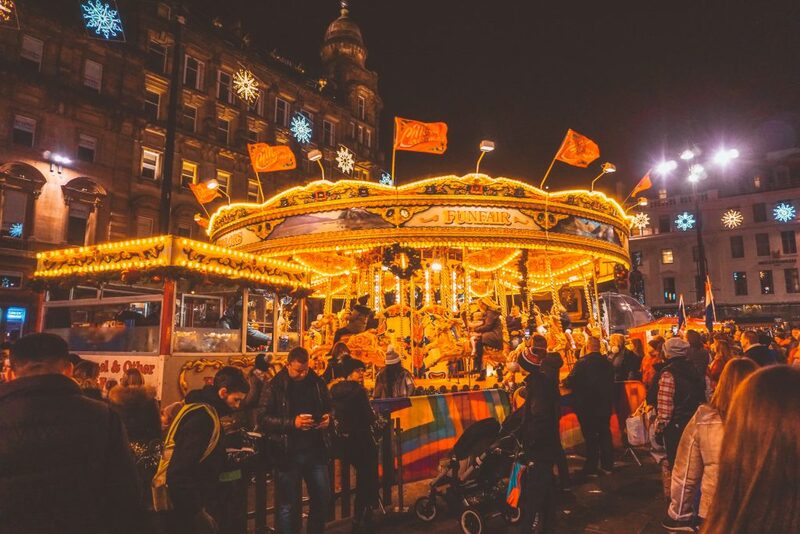 The Christmas Market in Glasgow usually goes live around the end of November and lasts until the 31st of December, so you only have slightly more than a month to see it. Oban Winter Festival is a ten day event in the town, in the north west of Scotland. Markets are held in church halls, with home made Christmas decorations, paintings and even a Clootie Dumpling competition. 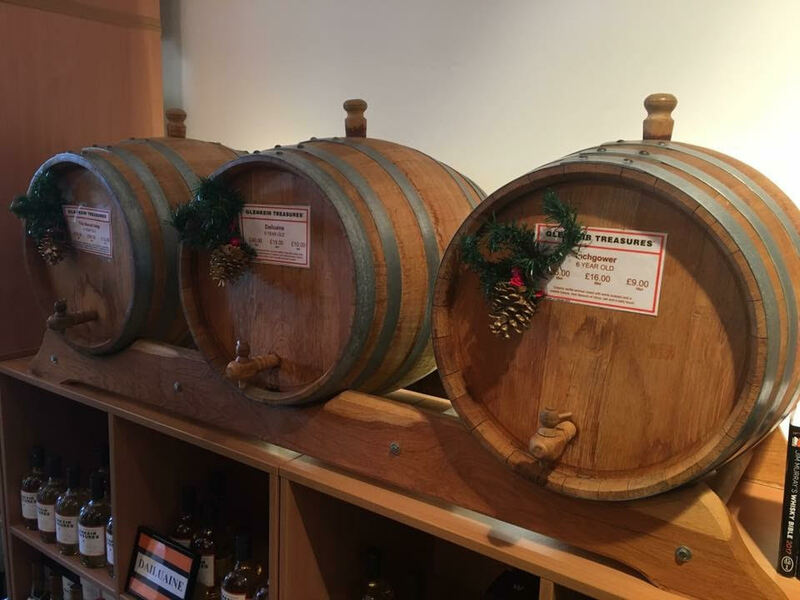 Oban Whisky Distillery not only offers yet more market stalls but tours and samples in their shop so you can try out their amazing whisky for yourself. There are evening Ceilidhs so you can try some traditional Scottish dancing and pubs throughout the town to round off the evening. Hot Pimms is served while the fireworks are on and the town’s McCaig’s Tower is also lit up giving the perfect photo opportunities. And don’t forget to hang around until the rousing rendition of the Scottish classic, Auld Lang Syne! The next morning watch the sun rise while having a stroll along the town’s promenade. From here you can look out to the little islands of Kerrera, Lismore and further afield, the Isle of Mull. You could even jump on a ferry and visit the islands, you won’t regret it! 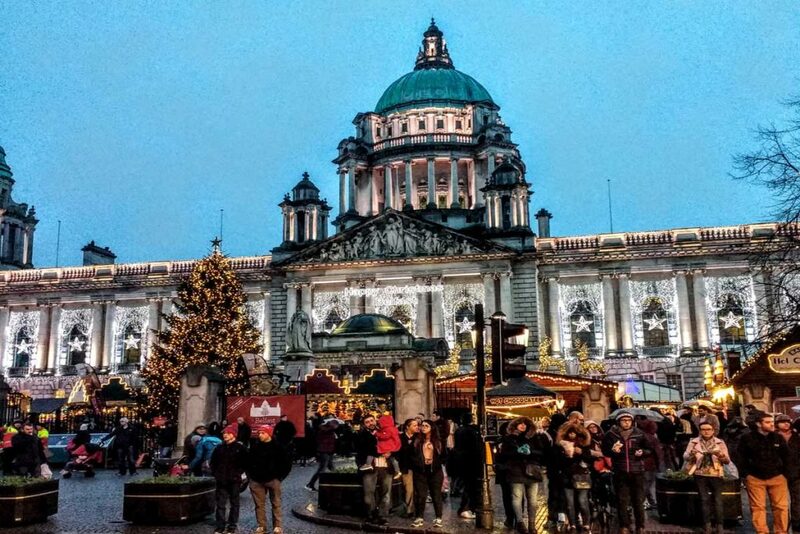 The Belfast Christmas Market is located in Donegal Square directly in front of Belfast’s City Hall. A riotous gathering of colour, sound, and light, the Christmas market is the place to be in Belfast, particularly in the evening. The Market takes place from November 17 until December 22nd and it is the perfect place to get your Christmas spirit going. There is a great street food scene at the Market that includes food from around the world. Italian nougat, Belgian chocolates, French tarts and a fabulous Breton patisserie, cheese and burgers from alligator to wild boar and sweet treats galore. You can even roast marshmallows right in the market itself. The traders are all handpicked and include handcrafted items such as scarves, beautiful Christmas ornaments, candles and woven goods. There are kiddie rides, a Santa’s Grotto, adult beverages, buskers and entertainment. My personal favourite activity was trying the many food vendors and experiencing the French treat Tartiflette, which is essentially potatoes cooked in tons of butter and cheese, onions and lardons (bacon). It’s a small market with a lot to offer and it’s completely accessible for everyone – the perfect way to begin your holiday celebrations. The biggest Christmas market in London is Hyde Park’s Winter Wonderland. It attracts lots of locals and tourists every year. There are lots of activities to do there, so everyone can find something fun for their interest and age. If you are a thrill seeker, you will enjoy the different roller coaster rides. Foodie lovers can try different cuisines while walking through the market. My personal favourites are the German sausages and for dessert the Hungarian chimney cake. Winter Wonderland is also the perfect place to buy some special gifts for your loved ones. There are several stalls selling handmade products. Couples can enjoy a romantic evening ice skating around a Victorian bandstand or visiting one of the many spectacular shows that they have on. The circus performances, comedy nights and ice sculpture exhibition will amaze any visitor. This year Winter Wonderland is open from 22nd November 2018 until 6th January 2019. To avoid the crowd visit during a weekday. Entrance is free of charge to Winter Wonderland; however, you will have to pay extra for the different attractions and rides. Located in one of London’s most popular neighbourhoods, Winterville is only in its second year and is already a local favourite. 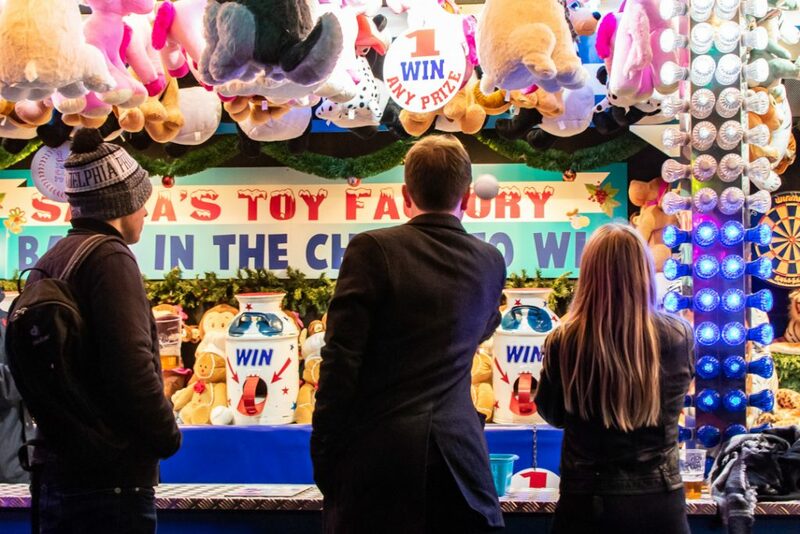 The festival rivals Winter Wonderland with its incredible food and drink selection and array of activities available to book. From comedy shows and a circus to crazy golf and roller disco, the activities are aimed towards children and adults alike. 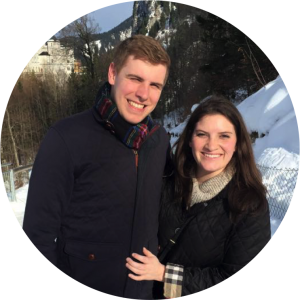 Clapham is filled with young professionals, so it’s no surprise that Winterville offers plenty of fun for adults. There are DJ nights, films showing at Backyard Cinema, and plenty of craft food and beer on offer, with some of the best Street Feast vendors serving up the goods. Not to mention, an adults-only puppet show called “Knickers in a Twist”! The ‘market’ opens on Saturdays and Sundays, with local craft vendors covering all of your Christmas gift needs. There is an entry fee to get into the market, but it is waived with any pre-booked activity. 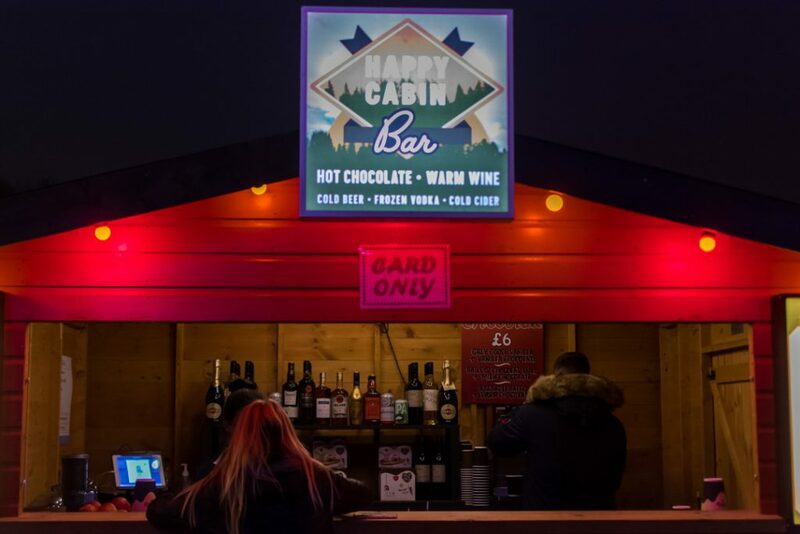 So, whether you want to catch a Christmas film or go for a round of crazy golf, book your activities online in advance and head over to Clapham Common for an awesome night at Winterville! 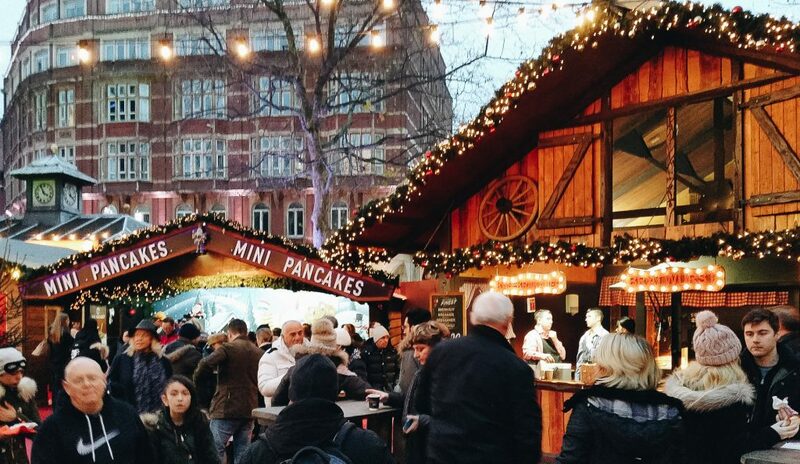 Want to indulge in seasonal food and mulled wine while doing your Christmas shopping in Central London? Then look no further than Leicester Square! The newest market in town, Leicester Square Christmas Market has only been around since 2016, and it’s back for its 3rd year in 2018. Expect lots of tasty treats, beautiful handcrafted presents and decorations and lots of delicious drinks (which may include lush chocolate fountains!). But the highlight of Leicester Square Market is its Spiegeltent, a beautiful velvety venue home to various shows, which include fabulous burlesque, boylesque (yes, expect men in lots of glitter! ), comedy and musical performances. Set in the heart of London, Leicester Square is the perfect fun-with-a-touch-of-quirky stop to add to your list of Christmas markets to visit this year! 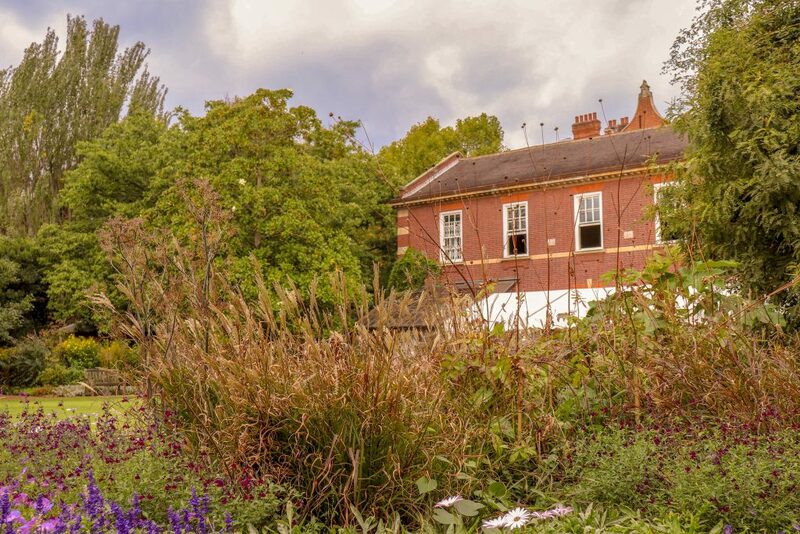 In a secluded area of Chelsea, along the Thames River, lays London’s oldest botanic garden. Since 1673, Apothecaries used this land to grow and study medicinal plants and here, every year, takes place a Christmas Fair during the last weekend of November. In the Chelsea Physic Garden, you will find more than 100 handpicked suppliers. British luxury artisans showcase unique products. The variety of merchandise is huge like the costs of them, ranging from finest cashmere jumpers to handmade Christmas decorations. The location of the Fair is stunning since the garden is tucked behind alleys of red bricks houses. And attending the Christmas Fair gives you the opportunity to visit an off-the-beaten-path London destination with a botanical essence. Upon entering the garden, you will notice the UK’s largest fruiting olive tree. 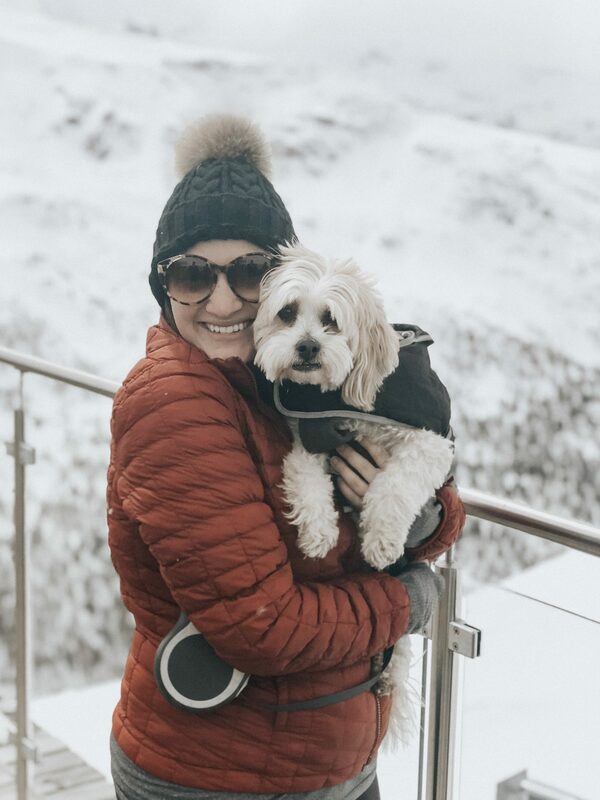 During the Christmas Fair, British designer Jane Means will offer present-wrapping master classes, and the cafeteria will serve warm teas and drinks and pastries to immerse you in a festive atmosphere. Which Christmas market do you want to visit this year?